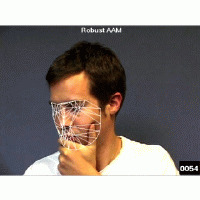 Active Appearance Models (AAMs) are generative parametric models that have been successfully used in the past to track faces in video. A variety of video applications are possible, including dynamic head pose and gaze estimation for real-time user interfaces, lip-reading, and expression recognition. To construct an AAM, a number of training images of faces with a mesh of canonical feature points (usually hand-marked) are needed. All feature points have to be visible in all training images. However, in many scenarios parts of the face may be occluded. Perhaps the most common cause of occlusion is 3D pose variation, which can cause self-occlusion of the face. Furthermore, tracking using standard AAM fitting algorithms often fails in the presence of even small occlusions. In this project we developed algorithms to construct AAMs from occluded training images and to track faces efficiently in videos containing occlusion. We evaluated our algorithms both quantitatively and qualitatively and showed successful real-time face tracking on a number of image sequences containing varying degrees and types of occlusions. The image sequences are shown below. Shape modes generated from unoccluded and occluded training data. The resulting shape modes are very similar. Appearance modes generated from unoccluded and occluded training data. As shown in the paper the modes generated from unoccluded data and from data containing up to 45% of occlusion are very similar. Accurate tracking using an AAM constructed using image sequences containing occlusion. Comparison of using the (non-robust) project-out algorithm and the efficient robust normalization algorithm on an image sequence with occlusion by a black box. Comparison of using the (non-robust) project-out algorithm and the efficient robust normalization algorithm on an image sequence with occlusion by a hand. Comparison of using the (non-robust) project-out algorithm and the efficient robust normalization algorithm on an image sequence with self-occlusion.